"It is so easy, really. We Catholics follow what the pope says." On the manner of receiving Holy Communion, a period of transition (not exceeding two years) is granted to the Neocatechumenal Way to pass from the widespread manner of receiving Holy Communion in its communities (seated, with a cloth-covered table placed at the center of the church instead of the dedicated altar in the sanctuary) to the normal way in which the entire Church receives Holy Communion. This means that the Neocatechumenal Way must begin to adopt the manner of distributing the Body and Blood of Christ that is provided in the liturgical books. 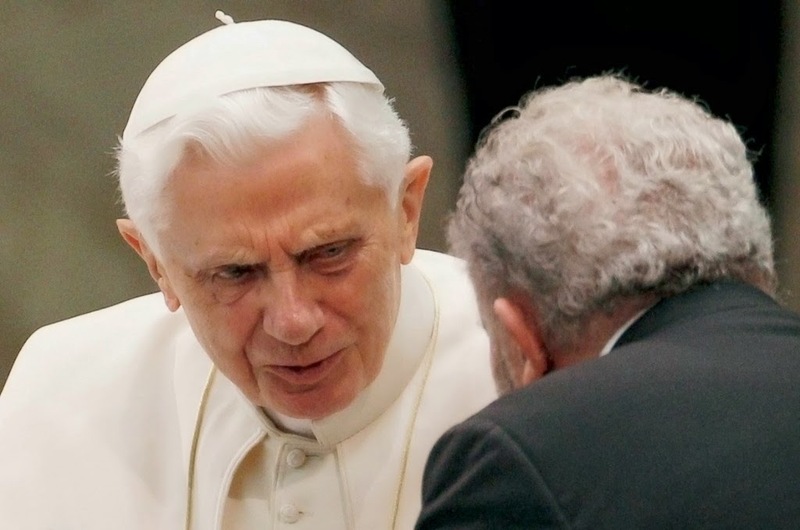 "I am to inform you of the Holy Father’s decisions." Following the letter, the Neocatechumenal Way DID NOT do "what the pope said." "Arinze, to tell you the truth, is really not for the Way, and I don’t know what credentials he has." 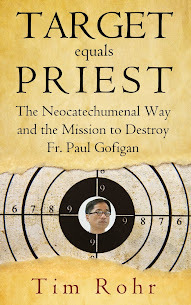 "It is the first time in the history of the church that we were give permissions for the variations that is being done in the Neo Catechumenal Way, officially by the pope." "Precisely to help the Neocatechumenal Way to render even more effective its evangelizing action in communion with all the People of God, the Congregation for Divine Worship and the Discipline of the Sacraments recently imparted to you in my name certain norms concerning the Eucharistic Celebration, after the trial period that the Servant of God John Paul II conceded. I am sure you will attentively observe these norms that reflect what is provided for in the liturgical books approved by the Church." "In granting a period of two years for the adaptation of the manner of distributing the Communion of the Body and the Blood of the Lord: we have always shown to the many brothers ...that in the Holy Eucharist the Lord makes present his love, dying and rising for them; and not only that, but prepares a table, an eschatological banquet, which makes Heaven present and where He himself, full of love, has them sit down and comes to serve them: “He will have them recline at the table and will come and wait on them” (Lk 12:37). Nice words, but Kiko here proclaims himself pope and tells the real pope that he will do it his way. 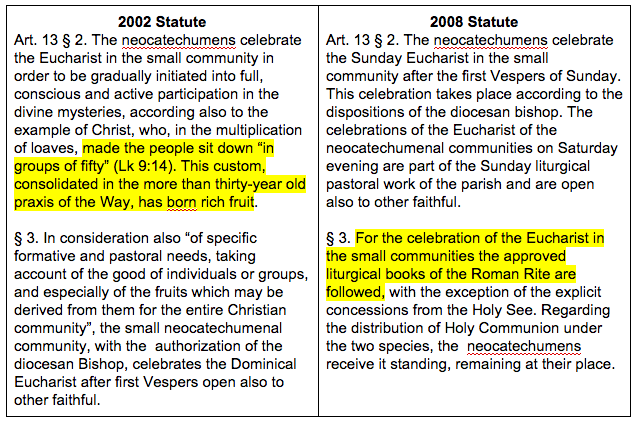 In 2008, with the approval of the final version of the Statute of the Neocatechumenal Way, the pope removed the section in Article 13 of the previous statute which permitted neo-communicants to remain seated when receiving communion, and replaced it with the directive to follow the liturgical books which was already given in 2005. Yet, Mr. Perez and his fellow neos continue, almost TEN YEARS later, to receive the host SEATED, because RECEIVE, according to the liturgical books also means to CONSUME (GIRM par 161). It does not mean to take the host standing and then sit back down and consume later, which is how Mr. Perez and his fellow neo's, who say they "follow what the pope says", do. 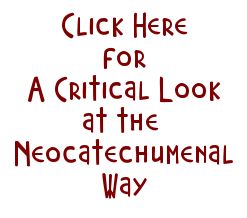 Members of the Neocatechumenal Way, including Archbishop Apuron, have been asked time and time again to please demonstrate where your group has been granted this special permission. NEVER has it been produced. Perhaps Mr. Perez, who "follows what the pope says" will do so. Shall we add another counter? go to Diana's blog for more better information folks rather the Rohr philosophy. Rohr info is one sided and purely prejudice. Hear that ya'll. Get on over to Diana's blog so ya'll can get some "more better information". I'm one sided and prejudice. Wow! What are we going to do for fun when this is over! Yup, the ubiquitous double comparative makes me bite my lip in restraint just to be charitable. Otherwise I will be rolling in amusement at the grammar faux pas. Can't even get the words right, more so the substance of what 9:19 AM is ranting about. Anon 9:19 "Rohr info is one sided and purely prejudice." Sure, and Diana's blog is fair? Been to that blog and it felt like I was walking into a cesspool. No thanks, I will stay here where the air is truthful and clean. BTW we are on the side of truth. If that makes us one-sided and "prejudice" (d) then so be it. Truth and honesty will prevail in the end. It is sad how the author and other community members like him continue to kid themselves of the errors and problems inherent in the NCW methodology. As if a blessing from the Pope is some sort of carte blanche for the coercion and guilt inducing tactics they employ during the scrutinies; the manipulation of scripture to keep their members subservient; the altering of the sacraments that render them unrecognizable; and the harassment of the members who leave the ncw because they choose to protect themselves and their families in ceasing and refusing to participate in these unethical and illicit activities. Not a single Pope has ever approved of any of these real and documented institutionalized conditioning and browbeating tactics that the leaders in the NCW willfully impose on their members. We need to remain in prayer for those members who sincerely seek salvation through the Church that they recognize that path they desire is not dependent on Fr. Pius' or their catechist's approval. I doubt if the Pope is aware that neo members are not permitted to ask questions of their "catechists" or that they quote scripture out of context to further their agenda or that they tell their neo members that family and friends who are non-noes are "idols" with whom they must break ties. Why is that some neos give their assets to the organization and yet the arch owns a house in Adacao? Why doesn't he sign over the deed to his house to the Neo Way and put the deed in the black trash bag? How does he justify owning property when other neos (not the ones in charge but those made to feel they must give up their personal assets to the organization) give up what they own? The neo leaders keep their members in the dark regarding what the Pope has approved. They cannot question what goes on. How anyone can be part of a group that forbids questions but demands loyalty to the exclusion of family members? This is suspect from the get-go, no matter what their intentions. Tell the truth, arch. Show the Papal approval that supports your illicit neo practices. Shame on you, arch, for no longer living the example of Christ. Be careful attributing acts of nature to God's favor or disfavor. The neobots will make a spin that the downpour is God blessing them. Some of us are inclined to think the saints above are spitting on them. My calling, my conversion happened before Benedict and Francis both became Pope. I will follow the traditional way and not the high way. It is sad to see letters like the one written by Mr. Perez. It only verifies that neocats do not think for themselves. They are told by their catechists and responsibles this and that and to believe it no matter what because they know better. To doubt or question is an act of disobedience and contrary to what is good for them. They do not think for themselves. If they were told that the earth is flat, they will believe that. So sad. This was denied in Diana's blog. She told me to come here with it. I'm doing so in case those that follow her blog are interested in what she denied. This was in reference to the audience Pope Benedict XVI had with the Neos in 2012 - 2nd last paragraph referring to the Eucharist. ALL THE POSITIVE REMARKS FROM THE POPE RE THE NCW'S VARIOUS GOOD POINTS, CANNOT NEGATE WHAT IS CONTAINED IN THE PARAGRAPH REGARDING THE MASS. - WHICH IS THE SOURCE AND SUMMIT OF OUR FAITH.
" However, every Eucharistic celebration is an action of the one Christ together with his one Church and is THEREFORE ESSENTIALLY OPEN TO ALL WHO BELONG TO HIS CHURCH." Note: Those who receive Communion on the Tongue (the NORM) are not welcome. Told to find another Mass. "It is the task of the celebration in the small communities — REGULATED BY THE LITURGICAL BOOKS THAT MUST BE FAITHFULLY FOLLOWED, with the details approved in the Statue of the Way "
" At the same time, the gradual growth in faith of the individual and of the small community SHOULD FOSTER THEIR INSERTION in the life of the LARGE ECCLESIAL COMMUNITY, whose USUAL PLACE IS THE LITURGICAL CELEBRATION OF THE PARISH, in which and for which it is implemented (cf. Statute, art. 6). Nevertheless in this process IT IS ALSO IMPORTANT NOT TO BE SEPARATE FROM THE PARISH COMMUNITY *PRECISELY* IN THE CELEBRATION OF THE EUCHARIST WHICH IS THE *TRUE PLACE OF THE UNITY OF ALL, where the Lord embraces us in the DIFFERENT STATES OF OUR SPIRITUAL MATURITY AND UNITES US IN THE ONE BREAD THAT MAKES US ONE BODY. (cf. 1 Cor 10:16f.). Note: The NCW is to favour the large ecclesial community's Mass, and not the NCW Mass. This shows we are ONE even though we are in different states of spiritual maturity. This was also what Pope Benedict wanted, but Kiko insisted "his" Mass drew converts. This, is not so. The people who were being converted, heard the catechesis for weeks and were drawn by the Holy Spirit to change their lives. It would not have mattered to them if they had to kneel at the Consecration, or if they had to receive the Eucharist after the priest received his, or if they didn't do a dance at the end.